Award-winning Halo A 52 performance is back. Now with 44% more power! 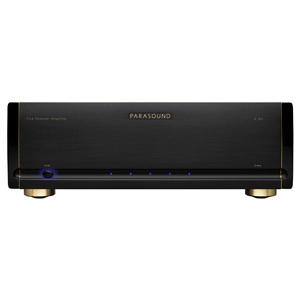 The new Parasound Halo A 52+ five-channel amplifier uses John Curl-designed circuitry for better performance than ever. And the original Halo A 52 is a tough act to follow. Home Theater Review said of the original A 52, "It's a truly musically engaging amplifier with an alter ego that likes to blow stuff up, should the mood or movie strike it." With 44% more power output than its predecessor, the A 52+ will drive just about any speaker with even greater explosive power and captivating grace. Featuring Class A/AB circuitry designed by the legendary John Curl, the A 52+ is direct coupled, with no capacitors or inductors in the audio path to ensure the cleanest signal. 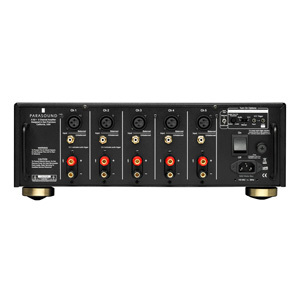 It provides balanced XLR inputs with discrete circuits. Full power is rated all the way down to 5 Hz for unrestricted low-end bass. 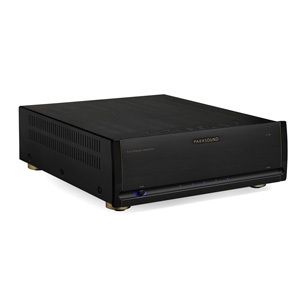 The Halo A 52+ has a custom 1.5 kVA encapsulated toroid power transformer with independent secondary windings for each channel and 100,000 µF power supply filter capacitance. It uses hand-matched JFETs for the input stage, hand-matched MOSFETs for the driver stage, and beta-matched 15 amp, 60 MHz bipolar output transistors (three pairs per channel). Other features include DC Servo and relay protection circuits plus auto turn on by audio signal or 12V trigger. "Overall, I really liked Parasound’s Halo A 52+ in every way," notes Kalman Rubinson in his Stereophile.com post for May 1, 2018 The new Parasound showed its superiority in its more graceful smoothness in the upper midrange and treble, and in low bass..."
Parasound design consultant John Curl has been a legend among audiophiles and electronic engineers for decades. He pioneered measurements to correlate musical accuracy with the materials used in parts, worked with world-class touring companies, has designed highly coveted audio classics, including the original Mark Levinson JC-2, Denneson JC-80, Vendetta Phono Preamplifier, and CTC Blowtorch preamplifiers; master recorders for Wilson Audio and Mobile Fidelity; and the mixing consoles used in live concerts by The Grateful Dead and the Montreux Jazz Festival in Switzerland. As Parasound's featured amplifier designer since 1990, he has created many products that have earned Parasound worldwide acclaim. John is particularly proud of what he and Parasound have accomplished together. "The circuits I design for Parasound are extremely sophisticated and are typical of products that are far more expensive," John says. 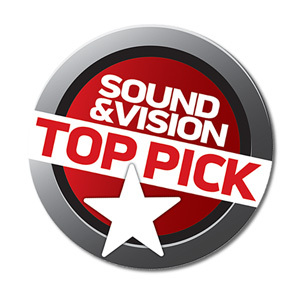 "I can't think of any other audio products that offer nearly as much bang for the buck." Every part used in the A 52+ is carefully chosen for its accuracy and reliability. Metal film resistors with 1% tolerance are selected for their precision and because their values don't drift as they heat up during operation. Polypropylene and mica capacitors are used extensively for their superior linearity and low dielectric absorption. Semiconductors are selected for superior performance in their specific roles in the circuit. Gold has the best conductivity of any metal, so we use high quality gold-plated input connectors and speaker terminals. The double-sided circuit boards are FR4 glass epoxy for long-term durability. 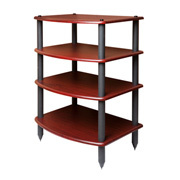 The chassis is made of heavy gauge steel to safely house the internal circuitry. This attention to detail when selecting parts makes the difference between a very good amplifier and an outstanding amplifier. The heart of the Halo A 52+ power supply is a 1.5 kVA toroid power transformer, chosen for its efficiency, low hum field, and high power rating. Encapsulating this massive power transformer in an epoxy-filled steel canister assures ultra-quiet performance. The A 52+ power transformer employs multiple independent secondary windings, so that each amplifier channel has its own power supply, assuring more than ample DC voltage at all times and under all conditions. It also reduces inter-channel crosstalk that can blur the sound and impair the correct sense of where instruments, dialogue and effects are positioned. Each channel's +/- 80 Vdc B+ and B- supply rails use high-speed rectifier diodes and two Rubycon custom-made 10,000uF electrolytic filter capacitors, chosen for their low Equivalent Series Resistance (ESR), dielectric absorption and resistance to high temperature. In addition, these filter capacitors are bypassed with smaller polypropylene capacitors to reduce AC ripple in the DC supply and to further eliminate noise and interference that is generated in AC power lines from computers and other appliances in the home. When the A 52+ is first turned on, there is a significant amount of in-rush current required to charge the enormous power supply capacitors. In order to slow down and suppress this in-rush current and to prevent nuisance tripping of a household circuit breaker, Parasound employs a NTC (negative temperature coefficient) thermistor. A thermistor cuts the in-rush current by approximately 50%. In a few seconds as it heats up to its operating temperature it it's essentially a jumper wire with zero ohms resistance. However, the A 52+ goes one step further for this circuit. After the NTC resistor has done its job of suppressing in-rush current a relay with gold contacts automatically activates to jump across it to completely bypass it. This extra step insures that the thermistor does not restrict any current whatsoever when the A 52+ is in full operation. Parasound's circuit topology is a hybrid of carefully chosen discrete transistors that result in superior performance at each stage. We use JFETs (Junction Field Effect Transistors) for the input voltage amplifier stage; MOSFETs (Metal Oxide Field Effect Transistors) for the drivers of a second voltage amplifier stage and bipolar transistors for the current amplifier output stage. Discrete transistors are more sonically accurate than integrated circuits commonly used by other brands. Each stage of amplification has transistors fed by the positive DC power supply and complementary transistors fed by the negative DC power supply. Thus, half of the devices amplify the positive half of the musical waveform while the other half of the devices amplify the negative half. This complementary topology is inherently linear, which reduces distortion and improves sonic accuracy. The A 52+'s input stage uses matched pairs of discrete JFETs arranged in a differential configuration. JFETs are ideal for the input stage because their inherently high impedance is unaffected by the impedance of source components. (Ordinary bi-polar transistors are low impedance devices) Differential configuration provides superior noise reduction. These precision input JFETs are also cascaded to produce the current necessary to drive the MOSFET drivers in the following stage. The driver stage provides critical amplification for which Parasound employed a complementary matched pair of MOSFETs selected for their tube-like sonic qualities. MOSFETs tend to generate less odd-order higher harmonic distortion than bipolar transistors. This is important because odd-order distortion sounds unnatural and fatiguing to the human ear, whereas even-order distortion is less offensive because it is consonant, rather than dissonant. The MOSFET driver stage prevents the harshness and brittle sound so often found in other solid state amplifiers. The amplifier's sonic characteristics are established by its input and driver stages. Now, the sole job of its output stage is to deliver the enormous current and voltage from its power supply to the speakers. Bipolar output transistors are better than MOSFETS in the output stage because of their higher safe operating area (SOA) and inherent ruggedness. Each channel's output stage employs four pairs of high current (15-ampere) bipolar transistors to insure long-term reliability, even with continuous high power operation and challenging speaker loads. Lightning-fast (60 MHz) transistors respond instantly to complex demands in the musical signal, virtually eliminating distortions that occur with "slower" transistors. Slew rate limiting and Transient Intermodulation Distortion (TIM) are simply not an issue in the A 52+. 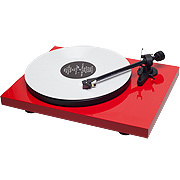 Pure Class A operation provides the purest sound. However, an amplifier operating entirely in Class A would be enormous, highly inefficient, and generate far too much heat. Class A/B combines the main advantage of Class A with the efficiency of Class B operation. It is a compromise that reduces the heat generated in pure Class A operation and the higher- order odd harmonic distortions created in class B. In Class AB, the driver and output stages are always partially turned on, which provides a nominal amount of pure class A operation. At higher power levels, when the musical waveform swings from positive to negative and vice versa, each bank of transistors is allowed to rest momentarily. This resting, or quiescent time, makes it possible to deliver high amounts of power without overheating. It also makes possible the use of passive cooling and avoid fans, whose noise can be heard over the music. 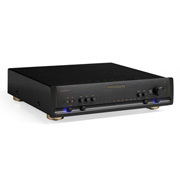 The A 52+ input and driver stages employ pure Class A while its output stage operates with higher level of pure Class A power than many amplifiers selling for twice or three times its price. The result is less fatiguing, more natural sound. Direct Current (DC) burns out speakers. Every power amplifier must have some way to insure that DC from its power supply never reaches its + or - speaker terminals. Most amplifiers simply use hand-adjustable trim controls to reduce their DC offset or capacitors to block DC. Unfortunately, trim controls can allow DC offset to increase over time, and even the most expensive capacitors in the audio signal path will "veil" sonic clarity and attenuate bass response. 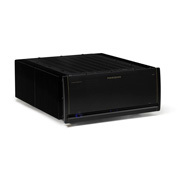 Parasound power amplifiers incorporate ingenious and fast-acting DC servo circuits, completely eliminating the need for coupling and blocking capacitors. The A 52+ is direct (DC) coupled from its input jacks to its speaker terminals. This advanced circuitry never needs adjustment or maintenance. It operates outside the audio signal path to keep the DC offset at the output of the A 52+ at a constant 0.00 Vdc. The results are startling clarity, freedom from listening fatigue, and formidable bass response. Each channel of the A 52+ has a high-quality protection relay with gold-plated contacts for long-term reliability. These relays function to protect either the amplifier, the speakers, or both. When the A 52+ is first powered on, these relays remain open for three seconds as the positive and negative power supplies stabilize and reach equilibrium. This prevents annoying popping or other transient noises. Relay protection also prevents damage to your speakers in case of a catastrophic amplifier failure. Any amplifier that doesn't use relay protection for its speaker outputs compromises the safety of the amplifier and your speakers. Specialized current-sensing transistors are connected to the output stages of the A 52+ to constantly monitor the current flow through the output transistors. If the current drawn by this stage exceeds a predetermined safe level due to a load impedance below 1 ohm or a short circuit at the speaker terminals, the output relay will open immediately to prevent the output transistors or other parts from failing. Each channel of the amplifier has two fuses for its positive and negative DC voltage rails. These fuses provide backup protection in case the over-current protection does not work in time, or if an internal part fails. In the event of a part failure, these fuses halt operation to minimize damage to additional parts. "The Halo A 52+ provided all the power that my speakers could handle, and did so with aplomb. 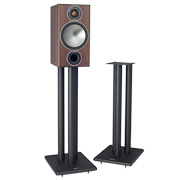 The soundstage was consistent with no blurring of indi­vidual voices or instrumental details..."
"The new Parasound showed its superiority in more graceful smoothness in the upper midrange and treble, and low bass that seemed better integrated with the upper bass... Overall, I really liked Parasound's Halo A 52+ in every way." "Listening with the Halo A 52+ in my system was a pleasure. Intense dynamic contrasts literally caused me to sit up straight on my couch. Stereo and multichannel music also sounded great, making it a versatile all-around performer for entry-level and advanced home theaters alike."